What is there to say about And One' With And One, you are getting what you came for. 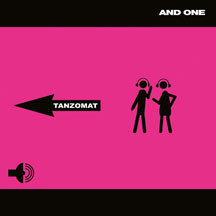 Tanzomat, the new album from Germany's most successful Synth Pop group features twelve instances of highly electrifying euphony. The new album finds our favorite Bodypoppers balancing the scales between massive beat madness and a more than healthy dose of rhythmic gymnastics, in the eternal quest for the holy Pop-grail; the perfect pop song. Gigantic tunes, big feelings, danceable and fun, and all recorded in glorious Bodypop-sensurround... Tanzomat delivers it all! Long-time fans of the band will appreciate the fact that the satire-tinged and versatile mix is very much going back to the roots of the early works of And One, newcomers will have to acknowledge that there is no better bodypop act on this planet at the moment and those people that have always harbored a dislike for Steve Naghavi and his band will yet again eat their hearts out for missing out on this masterpiece due to a severe lack of musical taste. To make a long story short: BUY IT!